The book present a critical review of the modern trends in aesthetic thought that appeared in India during the last hundred years. The aesthetic theories of Rabindranath Tagore, Brajendranath Seal, Sri Aurobindo, and Abanindranath Tagore are presented and analysed. The study makes out a case for a Fauvistic approach to the whole problem of modern aesthetics. 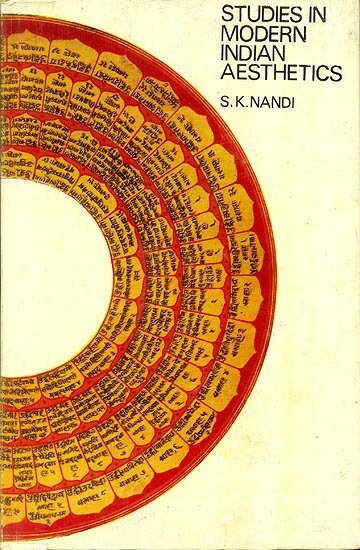 Following the historic-critical method Dr Nandi has ably brought out of the main trends and salient features of modern aesthetic thought in India. A meta-aesthetic consideration has been a taboo with the author and the book consider aesthetic values quaaesthetics. Dr S.K. Nandi teaches aesthetics at the Rabindra Bharati University and philosophy at the Presidency College, Calcutta. The Calcutta University awarded him the Sir Ashutosh Mukherjee Gold Medal in 1966 in recognition of his original contribution in the field of aesthetics. As Khudiram Bose Memorial Lecturer, he delivered a series of lectures on art and aesthetics at Calcutta University in 1973. Dr Nandi presided over the Ethics and Social Philosophy Sessions of the Indian Philosophical Congress in 1963. He is a past president of the All India Educational Conference and he presided over the Fine Art Education Section in the 1965 session of the Conference. Of his numerous publications, both in English and Bengali, mention may be made of An Enquiry into the Nature and Function of Art, Aesthetics of Robindro darsan Anvikshau, Nitividaya, and Darsan-Caritra. Modern Indian aesthetics meant for us Indian aesthetic ideas as formulated by people born after 1861, the year of the birth of Rabindranath Tagore. All such meredians are arbitrary and we thought that modern Indian aesthetics could be considered to have its starting point in Rabindranath Tagore. The ancient Indian world of ideas on art and aesthetics often peeped through Tagore's ideas and there have been occasional parallels. Sri Aurobindo and Abanindranath Tagore also came very close to the ancient Indian aesthetic ideas and as such they came close to one another. The objective concept of beauty, the idea of parama sundara, repeatedly occurred in them and often they came very near the Platonic idea. 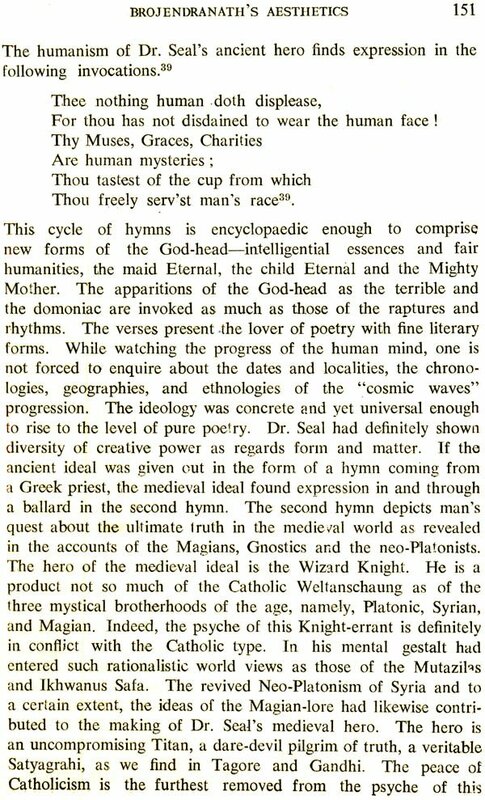 Sri Aurobindo, true to his philosophical discipline, often gave wonderfully subtle parallels of Indian and Greek thought and his ideas of cittasuddhi as done by art have aptly matched the idea of Kathasis as found in the sacramental synonym of the Greek mysteries. 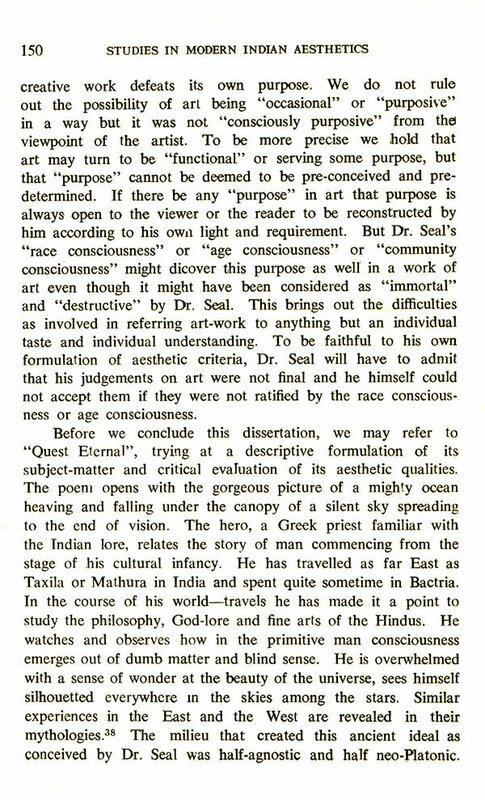 Brojendranath Seal's aesthetics was mostly dominated by Hegelian ideas and of course, in his unpublished autobiography, we come across some references to Indian aesthetic thought as found in Indian classics, ancient or medieval. In the analysis of the ideas of these four thinkers we have followed very carefully the traces of classic ideas, both Indian and Western, wherever they have been found relevant and modern parallels have been cited whenever they needed such a citation. The meaning and function of art as understood by the modern Indian thinkers will not be very different from the significance of art as formulated in the ancient Indian aesthetics. We will not fail to notice that art as "the soul of play and the soul of joy" as conceived in ancient texts of India, is not much different from the lila theory as understood by Abanindranath and others. The Natya Sastra was syncretic in essence and eclectic in appearance. It is said that Brahma distilled the essence of the Vedas and created the Natya Veda, by taking words from the Rgveda, gestures from the yajur Veda, music from the Sama Veda and rasa from the Atharva Veda. Brahma told the gods and the goddesses that through art (dance drama, to be specific) was expressed what was beautiful and charming in the world of matter and in the world of mind. Art would engender in all beings joy and love, righteousness, self-control and heroism; it would delineate the totality of life, it would convey a knowledge of life and super- life; it would satisfy the impulse of play and the impulse of joy; it would remove the disharmonies and the agonies of life; and it generally took away the burden of work and toil from all beings and would endow them with a sense of wonder and delight. These ideas as we find here in the germinal stage grew in stature with the passing of time and in modern Indian aesthetics we find some of these ideas worked out in great detail. Some have been taken up very seriously and examined with the meticulous care that they deserved. Others have been relegated to the backwaters as they were not important in a modern context. We will notice this phenomenon in the pages to follow. It would be quite interesting to note that society was a living organism and it lived through the ages with all its ideas, emotions, and methodology" has done some good in deciphering the meaning and significance of a particular aesthetic system by careful analysis and again supplementing this analysis by parallels for a fuller understanding of the problems involved. Thus the method of investigation has been new to cope with a new analytico-synthetic outlook on life and art. In the four chapters of the present work, we propose to discuss the aesthetic theories of Rabindranath Tagore, Brojendranath Seal, Sri Aurobindo and Abanindranath Tagore. Elsewhere we propose to discuss the aesthetic theories of Ananda K. Coomaraswamy and Nandalal Bose along with the aesthetic ideas of their less known contemporaries. This scheme was conceived as a monolithic unitary scheme, when I was working as a Senior Fellow, at the Indian Institute of Advanced Study, Simla, at the instance of Dr. Niharranjan Ray. The intention was to do the work in a single volume and my indolence and procrastination forced me to divide the book into two volumes; to this end I completely resign myself and consider this partition to be pre-determined and a matter of fait accompli. I thank my friends and colleagues, without making a particular mention of anyone of them, who helped and inspired me in this job of a research worker. My stay at Simla (where I did most of the writing of this book) was made pleasant by my wife, Leena and pleasanter still by Dhriti, my daughter and I thankfully remember them at this hour when the book has been made ready for the press.